DUST off your Marie Antoinette wig, slip into those platform shoes and grab your feather boa – it’s carnival time. Forget Rio or Venice, when it comes to carnival, Spain certainly knows how to put on a party and the top spot for parades is the small Catalan town of Sitges just 35 km south of Barcelona. Acknowledged by both the straight and gay press as Spain’s wildest party there’s enough ‘llum’ (light), colour, rhythm and fantasy to see you through to the end of Lent. The picturesque former fishing village has fancy dress down to a fine art and whether you enjoy ‘disfrazando’ (dressing up) or you prefer to leave that to the exhibitionists, there’s no way to avoid getting caught up in the party atmosphere during carnival. Situated on the Costa Dorada, Sitges has been a popular resort since the 1960s when its liberal attitudes challenged Franco’s strict Catholic regime and it is now a recognised gay holiday destination. Popular with young people from the Catalan capital, Sitges has been described as ‘Barcelona-on-Sea’ and, beware, in some places has the prices to match. Not surprisingly house prices here are the most expensive per square metre in Spain. Carnival celebrations last an entire week, this year from 19 to 25 February, and the fun begins on Thursday 19 February with the arrival of the Carnival King, Rey Carnestoltes, a monarch who reigns in Sitges for the week of festivities. His duties include visiting societies and local associations to spread the fever of the carnival excitement. The most recent addition is the carnival queen, chosen by a local society, who represents everything which is beautiful, sensitive and glamorous. The opening day of the celebrations is known as Dijous Gras (fatty Thursday) because of the feast of local dishes which are served, including El Xato (accent on the o). This is an immense salad of endives, cod, tuna, anchovies and olives covered in a unique sauce made from toasted almonds, garlic, olive oil, salt vinegar and chilli. In case this is not filling enough, it is served with a variety of tortillas and stew and followed by ‘coca de chicharrones’ for dessert, a kind of sponge cake made from pork scratchings, washed down with a glass of the local sweet wine, Malvasia de Sitges. The busiest days of carnival are Sunday and Tuesday when the local carnival guilds, after weeks of preparation, parade along the Rua (acute accent on the u) del Extermini. The regular population of just over 20,000 inhabitants is swollen with between 200,000 and 250,000 Catalan, French, German, English and Italian visitors descending on the town. In the afternoons the children of Sitges parade through the main streets of the town. A special fancy dress ball and disco is also put on for the little ones. The main parades begin at 10.30pm and the ‘carrozas’ (carnival floats) are a breathtaking wealth of bright colour, movement and music which leave spectators lost for words. After the procession finishes the town clears, leaving the streets momentarily quieter and strewn with confetti. But the party is just about to begin as the bars fill with revellers dressed as outrageously as can be imagined. The late-night Tuesday parade is a site not to be missed, as beautifully adorned drag queens totter through the streets in all their finery and their highest heels. Wednesday, the last night of the festivities, sees the solemn burial of the Carnival King, Carnestoltes, until the next year. With 18 beautiful beaches and an average of 300 days of sunshine each year Sitges is a great place to go for a bit of winter sun and to explore the narrow streets filled with designer and antique shops but remember to look up so as not to miss the fabulous modernist architecture. This bohemian town is abnormally mild, and with its own micro climate, is noticeably warmer than neighbouring Barcelona. 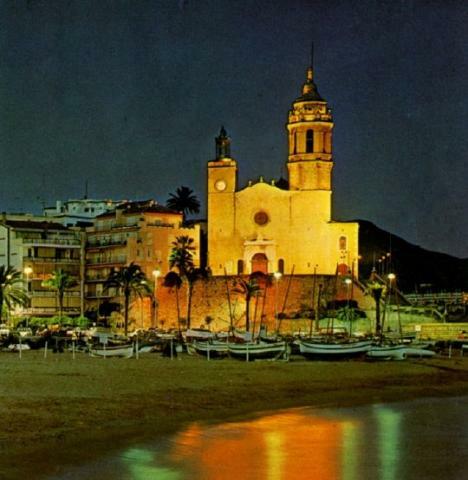 The symbol of Sitges is the Baroque parish church, known as La Punta, which is situated on a raised outcrop of land by the sea. Built on rocks between two beaches, throughout the ages Sitges was an impenetrable town. During Roman times there was a battalion situated in the town and later it became a Moorish castle and then a medieval fortress. The town was surrounded by walls which were fortified with turrets and it was outside the walls that the fishing town grew up. Hannibalby-passed Sitges on his way to Rome and attacks by sea were avoided throughout the centuries thanks to the steepness of the land. Historically the main trades were fishing, agriculture and wine-making, most notably red wine as well as the dessert wines Malvasia and Moscatel. Sitges was an important Catalan town in its trade with America, mostly exporting wine, and in the 18thand 19thcenturies ships and fishermen from Sitges could be found in almost any Mediterranean or American port. The population of the town grew with the improvements in road and rail links and the Catalans who had amassed their fortunes in America returned to their homeland where they built beautiful large mansions in the style of the times. With the arrival of the Catalan painter and writer Santiago Rusinol (n with ene thing) (1861-1931) at the end of the 19thcentury, the painting school, La Escuela de Sitges, came to life and before long Sitges became the leader of Catalan modernism and a major meeting point for artists who flocked there for the internationally famous ‘Fiestas Modernistas’ (Modernist Parties). Rusinol’s home and workshop can be visited at the Museu Cau Ferrat, the house where he settled in 1892, in the Carrer Fonollar. The street, which backs onto the sea, is full of old whitewashed mansions and is located behind the church. The museum contains paintings by Rusinol, as well as sculpture, painted tiles, drawings and other bits and pieces collected by the artist and works by his friends, including Picasso. In 1912, following Rusinol’s example, the American millionaire collector Charles Deering bought the neighbouring Maricel Palace to house his vast collection of art and antiques. This is now called the Museu del Maricel and is open to the public showing art from medieval to modern as well as a collection of Catalan ceramics and sculpture. The third museum in the town is the Museu Romantic, which shows the lifestyle of a rich Sitges family in the 18thand 19thcenturies, displaying some of their furniture and possessions including a set of working music boxes and a collection of antique dolls. 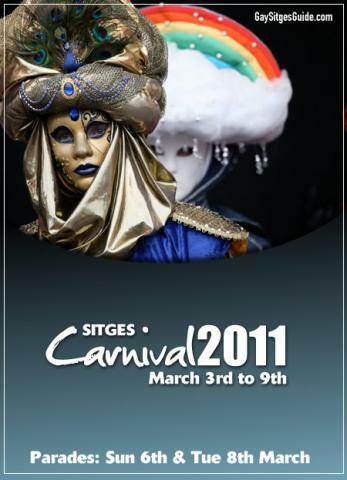 Sitges has become a cosmopolitan tourist town and cultural melting pot, hosting events such as the International Theatre Festival and the International Film Festival of Catalonia, dedicated to fantasy and horror films.